Rinse the razor after every stroke to remove hair and dry skin. Razor burn comes from shaving with a dull razor blade or shaving too close, which removes the top layer of skin, leaving it red and irritated. Additionally, close shaving often pushes the tops of the hairs back into the skin, creating ingrown hairs and a red rash or bumps that can become inflamed and painful. Minor razor burn may last a few hours, but more serious burns may last several days. Any razor burn will make you wish for quick relief. Stop shaving and give your skin a rest until the razor burn clears up. 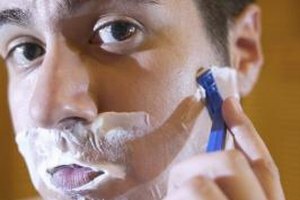 Shaving irritates the skin, making the problem worse. Rinse the irritated area with cool water to sooth the burn. Never rub, because scrubbing inflames the skin and makes razor burn and irritation worse. Sooth the skin with aloe vera, tea tree oil, or a mild astringent such as witch hazel. Avoid cologne, aftershave or other scented or alcohol-based products that are harsh and irritate the skin. You can also sooth irritated skin with a wet, cool tea bag. Apply an over-the-counter hydrocortisone ointment or cream once a week if the irritation is severe. Use the product according to label recommendations and avoid overuse, which may cause stretchmarks and thinning of the skin. To prevent skin irritation, shave only when necessary; frequent shaving irritates the skin. Soften the skin with warm water first, and then apply a shaving product formulated for sensitive skin. Shave in the direction of hair growth, using as few strokes as possible. Press a cool cloth against your skin for five minutes after shaving. Dry your skin gently and apply aloe vera lotion or a gentle, fragrance-free moisturizer. Never pick or scratch ingrown hairs, because the hairs may become infected. See your health-care provider if painful skin irritation or ingrown hairs don't clear up within a week.